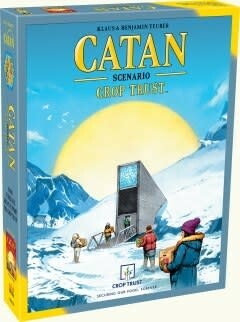 CATAN - Crop Trust is a compelling scenario for the CATAN base game. In cooperation with the Crop Trust, it allows you to experience mankind’s vital struggle for seed diversity. Players balance their individual need to harvest crops versus their collective need to store seeds for future use. By harvesting too many crops, they endanger the seed diversity necessary to a healthy environment. In so doing, they threaten their world with mass extinctions and a collapse of the food supply. Many of us live in crowded places in an ever more crowded world. Food shortages and famine stress populations in poor and marginal environments. Regional plant losses threaten crop diversity. CATAN - Crop Trust is an educational but very fun game experience for the family that may lead to thoughtful understanding about the balance between nature and agriculture. 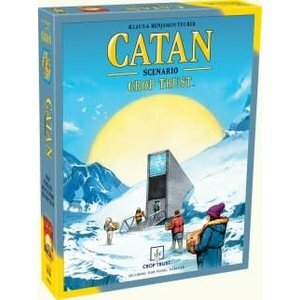 Here, we introduce simple, semi- cooperative rules that enliven and educate the Catan experience. The box also contains a specially-produced almanac which explains the history of the Svalbard Global Seed Vault, Frequently Asked Questions, and examples of the importance of crop conservation: from enabling scientists to develop more resilient rice, to more nutritious maize and heat beating beans. Royalties and a profit contribution go the Crop Trust, so every sale helps safeguard the precious building blocks of global agriculture.